Final match of Carlton Mid Tri-Series has been played between Australia and England at Western Australia Cricket Association Ground, Perth today. Australia continued with wniinng ton in a Tri-series and crushed England by huge margins of 112 runs and won the Tri-Series trophy as well. 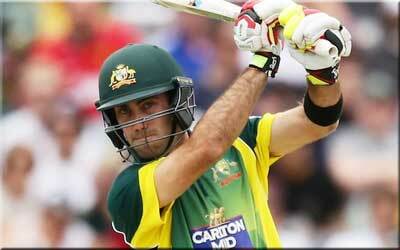 Glenn Maxwell's firing 95 runs of 98 balls and picked-up 4 wickets helps Australia to grab Tri-series Trophy. GJ Maxwell daclered man of the match for his wast contribution with bat and ball for Australia. Earlier, England won the toss and elected to field first. Australia could not made batter start and lost AJ Finch early in very first over for a duck. DA Warner and skipper GJ Bailey also could not stood in middle for long. SPD Smith played well and made 40 runs before lost wicket. But, Australian middle order and lower orders played splendid cricket and managed to put huge score of 278 at the end of 50 overs. GJ Maxwell played firing inning of 95 runs, MR Marsh contributed very well 60 runs and JP Faulkner's super fast inning of 50 runs in just 24 balls helps Australia to back in game once again. SCJ Broad (England) picked-up 3 wickets for 55 runs. Following huge target of 279 runs, England could not played well and continued to lost wickets in regular interwals. MM Ali made 26 runs and RS Bopara 33 runs for England and other batsmen failed to bat well. At last in 39.1 overs England all out scoring 166 runs and lost the match by huge margins of 112 runs.